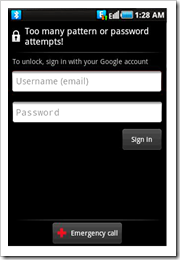 Android phones has a feature called “ Unlock pattern” which is there for security purpose. By activating this feature you can reduce the chances of your content being viewed by others. This feature may seem pretty neat to use, but one should be care full with this feature as it may lock your phone for good. ( ie when you forgot your unlock pattern or if you make to many faulty attempts). First of all, lets see how to activate the “Unlock pattern “ feature in your phone and then to how to unlock your phone after too many fault attempts. that’s it you had successfully activated the Unlock Pattern. Here you should enter the Google account which you had registered with your phone . After entering the Username and Password click on the sign in button as shown in the picture. Now, the phone will show you another screen to enter the new Unlock pattern for the phone, after entering the unlock pattern your phone will take you to the main screen ie. your phone is unlocked. In case you have not registered an account or your account is not working( it is showing invalid username and password) you can visit my another post Unlock the android phone after too many pattern attempts.